Brewers News - Decorators of Cambridge now have even more choice! 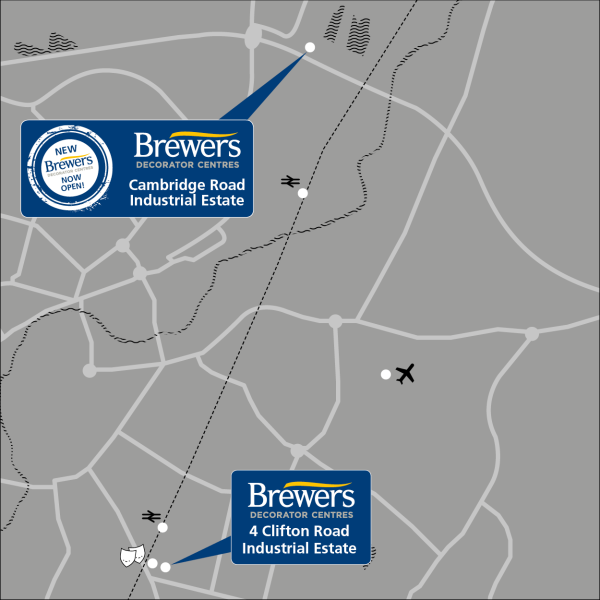 Brewers is pleased to announce the opening of their second Decorator Centre in Cambridge. Located on an industrial estate to the north of the town, just off the A14, it complements the existing store to the south and, being clearly visible from the road, is in a prime location. The store stocks all the main paint brands including Albany, Armstead, Crown, Dulux, Johnstone’s, Farrow & Ball, Little Greene, Paint & Paper Library, Zinsser, Rustoleum and Mylands. It can also supply a massive range of colours with six different tinting machines from Dulux, Crown, Johnstone’s, Zinsser/Rustoleum, Little Greene and Mylands. Dave Barnes, store manager, who is moving from the store in south Cambridge has 30 years of experience in the decorating industry – 18 of which have been with Brewers – so he has a vast range of knowledge both of decorating and the local area. Helping him out are two full-time members of staff and one part-time person who between them have experience within Brewers and other retail outlets. The store is much larger than the south Cambridge one which means there is a spacious showroom with a touch screen click and collect terminal, and a huge selection of wallpaper pattern books that customers can look through for inspiration. And with its big windows, there is plenty of natural light in the store to help customers make the right colour choices. Plus, as there are now three vans operating in Cambridge, customers to the north of the county can expect a more prompt delivery service. “Cambridge traffic can be a nightmare so instead of customers in the north part of Cambridgeshire having to wait until the afternoon for deliveries, we can now get supplies to them much earlier. Also as the stores are linked, we can transfer stock from the north store to the south and save our customers from doing the legwork,” says Dave. There is a range of special opening offers at the new store to find out more, join the Brewers community on Facebook and Twitter.